After 20 years performing around the world, Cirque du Soleil's "Saltimbanco" will make its final curtain call in December in Montreal, Canada, the international home of Cirque. From October 31 - November 4, Boston will have its final opportunity to experience this classic production that's been seen in more than 45 countries. 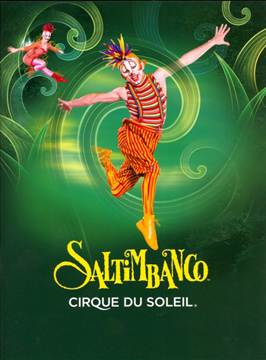 "Saltimbanco" will be presented at the Agganis Arena for seven performances only. "Saltimbanco"-- from the Italian “saltare in banco,” which literally means “to jump on a bench” -- explores the urban experience in all its myriad forms: the people who live there, their idiosyncrasies and likenesses, families and groups, the hustle and bustle of the street and the towering heights of skyscrapers. A signature show, it is inspired by the urban fabric of the metropolis and its colorful inhabitants. The show’s eclectic cast of characters draws spectators into a fanciful, dreamlike world, an imaginary city where diversity is a cause for hope. With a cast of 50 high-caliber artists hailing from 20 different countries, "Saltimbanco" features dazzling acrobatics and unbelievable athleticism during solo spots and epic ensembles. From the seemingly impossible balancing, jumping and spinning during the Russian Swing, to the gravity-defying Bungees and Trapeze, and the celebrated Clowns, "Saltimbanco" is entertainment for the entire family. For tickets, call 1-800-745-3000 or visit www.cirquedusoleil.com/saltimbanco.